Some reported receiving the first units of the iPhone 5 with bumps and scratches in the metal edges. Others shared in the forums of the company's own bad experience with your phone camera, the results of which appeared in a suspicious cloud of purple. 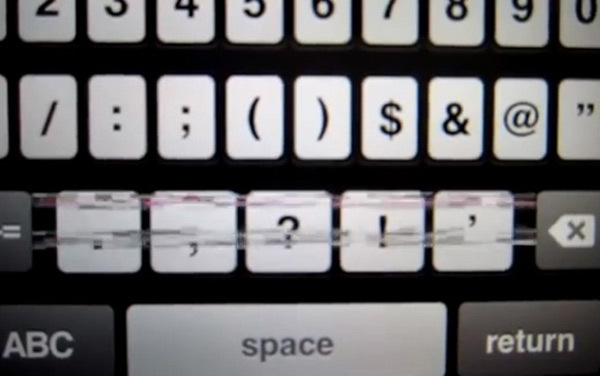 Now, users of the new iPhone have detected some problems in the device's keyboard. The incidence is very often played when the user accesses to sites where you must enter passwords, for example, when buying content on the App Store, the Apple App Store. What users see is a series of lines on the keyboard that adversely affect the display, but not the interaction that users perform on the various functions of the device. It usually happens ever after affected users have when we have a waiting popup text input. Some owners of the new iPhone have also indicated that the lines also appear on other occasions, within the user interface itself and not just the keyboard. But what is causing this issue? Is it a hardware problem?Perhaps a Factory problem? Experts in the field say that the problem could be related to two issues that are combined together and could be corrected by a software update. Would be, specifically, to a fault in the window manager for iOS that has not been properly integrated in iOS 6. Thus, the windows (to enter passwords and enter data in general) are being managed by the Springboard or desktop. The fault would lie in some of the steps of the process carried out by the team of associate these tasks. Thus, whatever the cause, it follows that the problem can be corrected through a software patch and not have to cause any replacement or repair of the physical components of the terminal. But what Apple says all this mess? Well, so far has not made ​​too many public demonstrations (not usual in Tim Cook's house), but we know that the company is aware of the problem and is working on it. It is probable, indeed, that the correction comes in the next update of iOS. And you, have you noticed anything strange about the lines on your keyboard?